How Does Social Security Disability Determine I am Disabled? Perhaps you have applied for Social Security Disability benefits, been denied or even have a hearing in front of a judge. There are several factors that will be considered to see if you qualify for benefits. First, the judge will look at whether or not you are doing work that can be considered substantial gainful employment. As of 2014-2015, this is defined as making over $1070 per month. That number can change, and historically, it has. Contact www.gaylordpopp.com or sgaylord@gaylordpopp.com for the current threshold. A Social Security Judge will also look to see if you have a specific impairment, that is, a medical condition that meets the requirements. They will look to determine whether you can perform any prior work, and how you did that work. If you are unable to do that prior work, they will determine if there is other work in the national economy that you could do, taking into account your age, disabilities, and your previous work. If you cannot, then it is likely you will qualify for Social Security Disability. 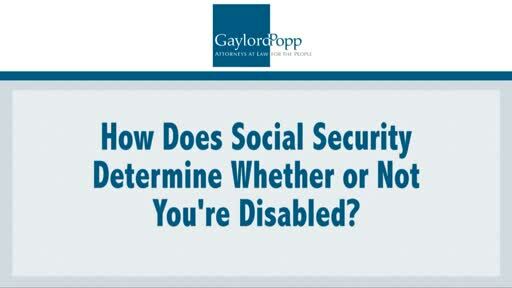 To learn more about disability law, I encourage you to watch the video above and to explore our educational website at https://www.gaylordpopp.com. If you have legal questions, I want you to call me at (855) 237-9390. I welcome your call.